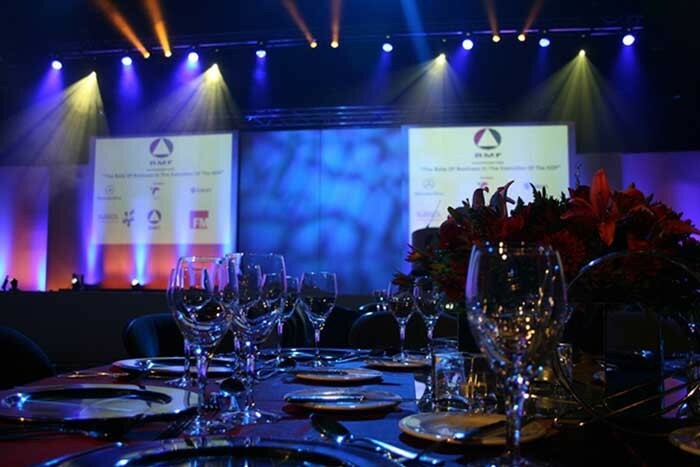 South African lighting designer Johnny Scholtz created an eye-catching lighting scheme with Robe moving lights at its core for the high profile 2013 Black Management Forum (BMF)‘s Corporate Update Dinner event, staged at Sandton Convention Centre (SCC) in Johannesburg. Working for lighting contractor MJ Event Gear, he collaborated closely with the set design and building team from Driftwood, who produced a stylish setting from a series of white flats. His starting point for the lighting design was to bring this ‘alive’ with colours and texturing in an elegant and appropriate fashion for the evening. In addition to the dinner, there was some background entertainment and a series of keynote speeches which were preceded by the reveal of the two new Mercedes E class vehicles. 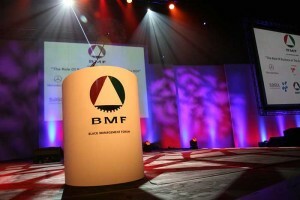 Mercedes-Benz SA is a long term sponsor of the event. The lighting rig included 12 Robe LEDWash 300s and 12 LEDWash 600s together with six ROBIN MMX Spots and a pair of DigitalSpot 5000DTs which were used for powerful and flexible projections onto the back wall. The LEDWash 300 LEDs were used to wash the two cars on display, while the LEDWashes 600s and LEDBeam 100s were the primary stage lights, producing a smooth, even coverage and complimentary beams. For the car reveal, the Robin 600 LEDWashes picked out and framed the cars while the LEDBeam 100s whizzed around making eye-catching aerial effects. The DigitalSpots were used to display logos and corporate idents on the backdrop – the content was pre-loaded into the heads and they were run from the grandMA console along with the lights. Johnny specified Robe fixtures for a number of reasons. Complimentary colour mixing across the ranges of units was an important one. The LEDWash 600 he likes for its "exceptional" zoom and even wash coverage, and the miniscule LEDBeam 100 for the "awesome speed and brightness". In the MMX Spot, he again appreciates the zoom, which makes it ultimately adaptable for many situations, the dual graphics wheel and the distinctive gobo projections. Johnny has been using Robe products in his work for the last four years. He comments that the brand is readily available in SA due to the hard work and foresight of local distributor DWR who "have really raised the bar with their magnificent tech support and friendly service". The BMF embraces high standards and sets tones and measures in business ethics, amongst black organisations and in South African society generally a network of highly skilled and dedicated BMF members provides constant input into government, business, trade unions and civil society. The organisation is pro-actively involved at all levels on policy formulation, strategic planning and other key issues facing the country.